Achaia is an interesting prefecture, which has a multilateral profile as it throbs with mountainous and coastal regions as well as cosmic and secluded settlements that alternate, creating a magnificent icon and sense to the visitors. The prefecture of Achaia belongs to the greater geographical district of Peloponnese and it borders with Corinth in the east, with Arcadia in the south, with Elia in the west, as well as with the gulf of Corinth and the gulf of Patra in the north. Achaia has approximately 300.000 inhabitants. 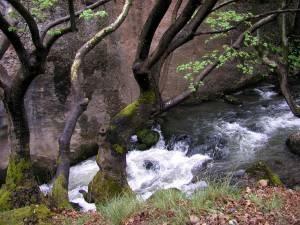 The prefecture of Achaia comprises of numerous towns, hamlets and villages, which are all very special. The interesting Aegio, which is the second largest town of the prefecture, the historical and scenic town Kalavryta with the popular ski center, the cosmopolitan resort and transportation hub Rio, the coastal village Diakofto, Kalogria with the infinite sandy beach, the traditional mountainous village Zahlorou, the seaside village Akrata with the beautiful natural sites, are the most renowned settlements of the prefecture of Achaia. Achaia, apart from being an ideal destination for your holidays, is also an important hub of the incoming tourism from Western Europe. Staying at this marvelous small guest house is a bit like visiting a ranch in the countryside, with dogs and horses, and even deer. It's a gentle environment with a stunning countryside view overlooking the village of Kalavrita. With an ideal location and easy access to shops, cafes and clubs, this hotel offers excellent facilities, comfortable accommodation and an excellent view from its roof garden pool and restaurant.